Alexcia Ali had not long put Pleasantville Secondary ahead in their Girls National Intercol final battle with Signal Hill Secondary at the Ato Boldon Stadium in Couva yesterday, when I was pushed in the back of the head by Gordon Pierre. Pierre is a Tranquillity Government Secondary school teacher and a representative of the Morvant Caledonia United football club—although the Pro League team suspended him today pending an investigation into the incident. 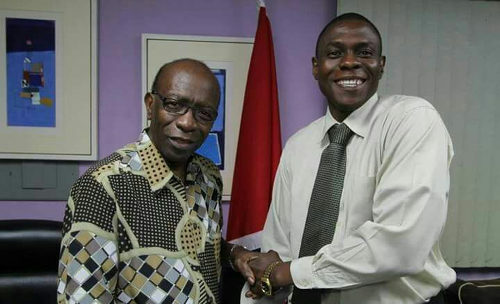 Photo: Tranquillity Secondary teacher and ex-TTFA press officer Gordon Pierre (right) poses with ex-FIFA vice president Jack Warner. He was a row behind and standing over me. I was sitting with my laptop opened in front of me, facing the football field. I had not seen him arrive as my attention was on the unfolding Intercol action. There was no conversation or argument—in fact, Pierre and I have not spoken in well over a year. Yesterday, there was only an attack; an ambush. Yesterday afternoon—presumably before his Facebook post—Pierre was served court documents in relation to a libel suit I initiated against him. Pierre’s response, according to my attorney, was allegedly a foul-mouthed, threatening phone call which left her shaken up. Then, he drove to the Ato Boldon Stadium and snuck up behind me in the press area, with what appeared to be a short blade—or certainly something sharp enough to slice me across my chin. Photo: A Facebook post by Gordon Pierre on the afternoon of 4 December 2018. Pierre was accompanied by Morvant Caledonia co-founder and former Trinidad and Tobago Women’s National Senior Team head coach Jamaal Shabazz, on his trip to the Ato Boldon Stadium. Shabazz subsequently said he knew nothing of the impending attack and issued a statement condemning the incident. Roughly two weeks ago, Pierre was Shabazz’s guest at the Trinidad and Tobago Football Association’s (TTFA) AGM where he was allowed in as an ‘observer’. 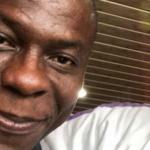 And he appeared as a guest on several occasions for TV6’s sport news or Joel Villafana’s sport show ‘Halftime’. On almost every television appearance, Pierre either defended TTFA president David John-Williams’ controversial Home of Football project or attacked John-Williams’ most outspoken critic, Trinidad and Tobago Super League (TTSL) president Keith Look Loy. It was a mission he also continued with relish on the social media. Differences of opinion are fine and even healthy. And nobody should be above reproach, including journalists. But now that such zealous fanaticism has led to a practising journalist being attacked in a crowded media centre at a national stadium during the biggest game of the Secondary Schools Football League’s (SSFL) calendar, who is willing to look at their own role in egging on this disaster-in-the-making? 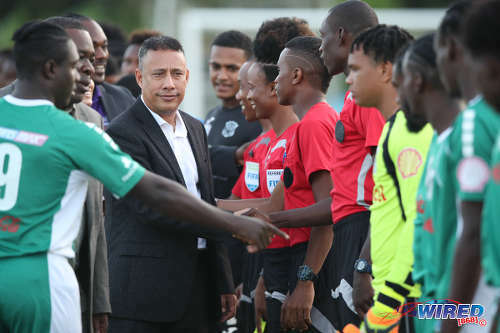 Photo: Commissioner of Police Gary Griffith (centre) meets the San Juan North Secondary players before kickoff of the National Intercol final at the Ato Boldon Stadium on 4 December 2018. On 16 March 2017, I wrote an article about the poor standards being set by the TTFA in terms of the behaviour of its officials. 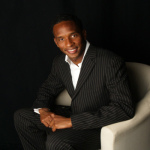 Pierre, in his then capacity as press officer for the National Beach Soccer, was one of the TTFA representatives named. Ironically, Pierre’s response to criticism of his behaviour was to launch into a tirade against me with a host of outrageous personal allegations. I asked him to retract his statements. He refused. And I initiated libel proceedings against him on 21 March 2017, so his claims would be either proven or disproven in the High Court. Pierre and I have not spoken since, although he has tagged me occasionally. Sometimes with threats. On Tuesday afternoon, he stepped out from behind the computer screen with a violent response to a legal procedure that will not soon be forgotten. To threaten an attorney with violence—as he was accused of—is a shocking lack of respect for the judicial system. To attack a journalist at an event is an appalling disregard to the profession, the police officers present, basic civility and law and order. 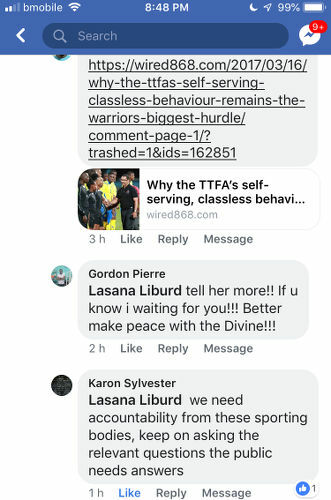 Photo: Gordon Pierre issues a threat to Wired868 managing director and journalist Lasana Liburd on Facebook. 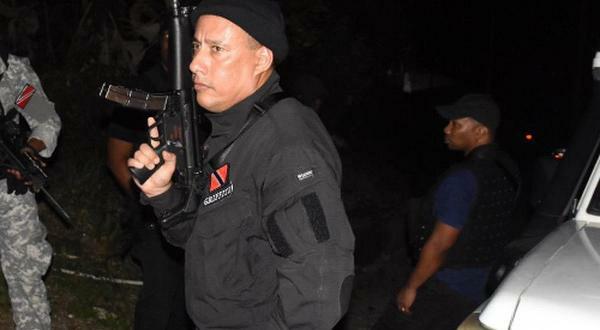 Commissioner of Police Gary Griffith was at the Ato Boldon Stadium and, once alerted, offered his regret over the incident and an assurance that the TTPS would do its best. That did offer some degree of comfort in the six hours it took between the Couva Medical Centre and Police Station before reluctant officers would finally take my statement. I was the person assaulted. However, in a way, Trinidad and Tobago’s judicial and law enforcement arms are the ones on trial, if they can be treated with such scant courtesy by not ‘Mr Big’ but a short-tempered school teacher. As a journalist with over two decades’ experience, I know my job. It is to provide the public with the information they need to make better life decisions; and to hold accountable the people responsible for delivering services to us all. I will not shirk that responsibility now. Hopefully, the officers of the TTPS will also do their jobs. And hopefully those who try to exploit aggressive pawns for political gains, television ratings or whatever perceived benefits they hope can be derived, will also consider their roles. Pierre is by no means the only angry young man, desperate to be led towards the gravy train. 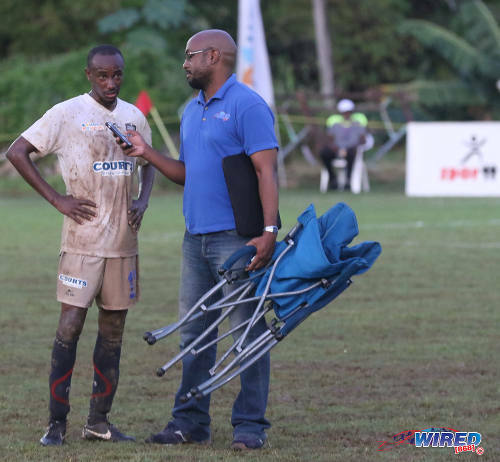 Photo: Wired868 journalist Lasana Liburd (right) interviews Morvant Caledonia United captain Kareem Joseph after their Pro League contest against San Juan Jabloteh at the Morvant Recreation Ground on 16 October 2016. 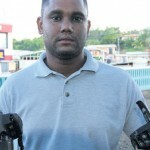 The Media Association of Trinidad and Tobago (MATT) has been made aware of a disturbing incident involving a former member of the executive and [Wired868 managing director and] journalist, Mr Lasana Liburd. According to a report, received by MATT, Mr. Liburd was attacked while performing his job at the school’s Intercol finals yesterday. This attack is said to have been initiated by someone who Mr Liburd had recently written an article about and initiated legal action against. MATT views this situation as unacceptable and unequivocally condemns the attack on any journalist performing their duties. Citizens are reminded that Freedom of the Press is enshrined in this country’s Constitution and there are legal avenues of redress for persons who feel they are aggrieved by articles written about them. Physical attacks are not one of those avenues. In MATT’s view, this matter has been made even worse as the attack occurred at an event in which school students were in attendance. Mr Liburd has reported the matter to the Trinidad and Tobago Police Service and we trust that it will be dealt with expeditiously in order to send a message that such acts will not be tolerated. 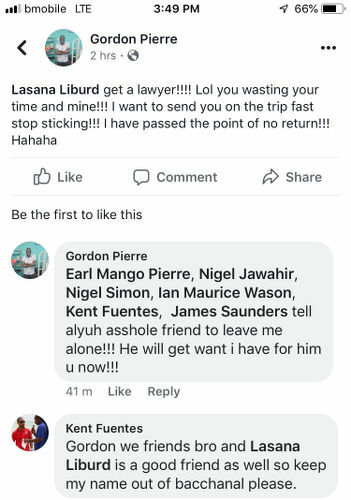 And while the matter remains before their court and the investigations continue into the violent attack, Gordon Pierre’s handlers should caution him about placing threatening material on his page. It goes to motive you thug. Brian Harry I saw that. Very immature. 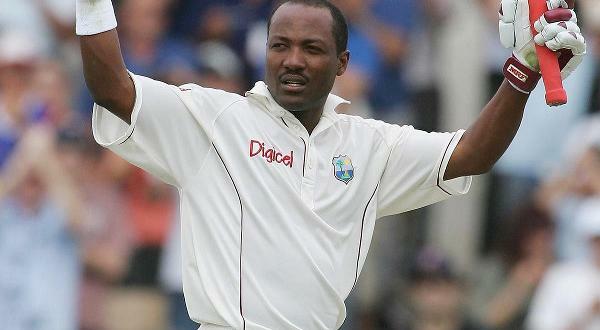 Tony Maxwell Hatt – he’s not smart. I hope the authorities are paying attention. Malik i only hope he’s getting good advice. Brian I don’t care he’ll get no empathy from me. It’s no coincidence who he’s affiliated with. Malik exactly. And by the way I feel the same way. Lasana you did not answer Travis’s initial question, what was the beef about. Raoul Roger Romain, Gordon made a serious of Facebook comments at me in which he accused me of criminal behavior and claimed he had proof. I told him to either show his proof or delete and retract. He refused to delete and retract but he insisted he had proof. And in the end, I decided to go through the trouble and expense of going to court to clear my name conclusively and to erase all doubt for anyone who was a witness to his posts. To the Minister of Education, what does it take to be qualified for hire as a teacher? This obviously needs to be reviewed. The mad man you hired may one day turn on his students. Premeditated assault with a weapon… and he is not in jail yet? Gary Griffith and the whole battalion, please tell me what it takes to get justice… do you have to have a special last name? Liburd is not one? Lasana I am very sad over the incident that took place I do hope you are OK and in high spirits knowing everything will work out for your good..
Well I guess it’s a case of one can say what he wants and another have to thread carefully because there is no evidence? In my opinion Lasana Liburd as a journalist who have hit a lot of people for 6 you shouldn’t be so easily offended your skin should be thicker. But that’s just my opinion. Just like he was wrong to react the way he did, you were wrong to react the way you did. It shouldn’t have gone so far in both instances. Travis let me humor you and ask how I was thin skinned. Travis cat got your tongue? Travis do you know what he said about me? If he says he stands by what he says and has proof, then am I overreacting by saying let’s meet in court and bring his proof? You must be playing to your gallery because I find it hard to imagine you actually believe the things you say sometimes. And it is up to the judge to say I overreacted. If the judge feels so, my case will be dismissed and he will award costs to Gordon for wasting court time. I will leave this talk with you because you have got to be singing chorus for some faction or the other. Lasana Liburd singing chorus ? As soon as ppl don’t go down with your point of view it’s a problem, you petty for taking the man to court and I stand by that , you shoulda find another way to resolve it. Travis sorry if I overestimated you by saying you’re singing chorus then. My apologies. Travis I don’t wish to belabor the point anyway. I’ve got my answer and your point is registered. Sorry for any slight on my behalf and I’d consider the matter closed now. Travis Mulraine Spin it however you want. There is NO justification for threats of violence or actual violence! Trying to invent one ain’t gonna do anyone any good. I know we value all people’s opinion here eh but some of us need to exercise our right to keep quiet! At no point u said gordon wrong for what he said or the numerous threats thereafter but lasana wrong for taking him to court?? So Lasana the victim of a cowardly attack by a vindictive person is to blame cause he should not have carried the man trying to sully his character to court? Victim shaming is a helluva thing..
Plz note this is my opinion which i am free to share as you were free to share yours, so don’t @ me! There is a difference between being a yes man and being someone who looks at each issue and studiously measures both sides. It’s wrong to make accusations that aren’t true. It was actually big of Lasana to ask for proof or removal before bringing court action. Most would have just sent in pre-action protocol letter at first chance. It’s also wrong to make threats and then act violently upon those threats. Not sure how anyone cannot see this..
People can’t get away with idle gossip or allegations holding no truth anymore, these violent actions are of course unacceptable but the real lesson will come from legal actions and court judgements to send out a real message to the “technocrats who ride high in positions of management and feel invincible and able to cast such aspirations on others, shame on you! I’m still in shock over this incident. Thankful that it was not worse and physically Lasana seems to be OK. But dam! This must have been a really traumatic incident and it really ought to be investigated fully. Especially due to the circumstances of the assault at a school event. The ministry should use this opportunity to rid itself of a bad egg. ..We could argue. We could disagree. We could vex. What we CANNOT do is use violence against other people because they “opposing” us or because they are “The Other”. THAT is Gangsterism. And we do NOT need that in football/sport..
Lasana Liburd do we know if this this person still on the TTFA payroll? Has any statement been issued by the TTFA regarding the conduct of this individual? Exactly Sean. It is very scary to think what could have happened. Not funny at all. Thank God for life bro. Dont leave it to die at all. Teach the teacher a lesson. Lasana Liburd, thankfully there is a happy ending to this story, you are probably rightfully shaken but otherwise OK, I hope. Clearly, this person had a particular intent, because I don’t think it’s legal to walk around with weapons. Worse, he did not seem too bothered about the crowd and type of audience. Maybe he really should be given a mental evaluation. I can’t recall the particulars of the post, but if he were not directly the subject of it, why take medicine for other ppl sickness? Hopefully the law follows its course and justice is soon served. I hope the young ppl present are not traumatised over this incident. And I am glad you did not seem to have your family with you. The man tripped when he saw Mr Live Wire, and thank our Father God that the injuries that he sustained wasn’t life threatenting because it wouldn’t have been only Coach Michael Mc Commie R.I.P. funeral we wudda be attending. In the presence of school kids and that’s the manner in which he conducted himself,shameful,and to think he’s a member of staff at a school. 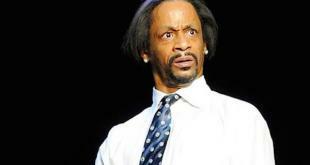 Wait so you let Gordon beat you up? The best way to make yourself look like a tough guy is by striking from behind and using weapons. Okay… he’s convinced everyone. 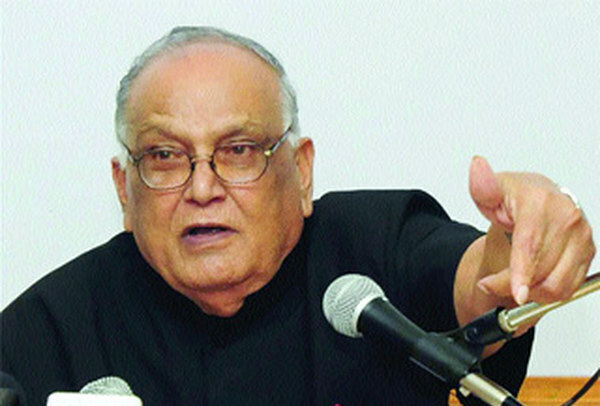 ..All those who have promoted this character for political ends will now watch him take the heat. It’s not like they didn’t know of his tendency to thuggery. It was convenient to ignore it..
Hey bud – sorry to hear about this unfortunate incident. Hope the police do their job and follow up and through with the case. Situations like these need to be nipped in the bud before they escalate to more serious consequences. If he was so aggrieved by what you wrote about him, why didn’t he just sue you for libel, or issue his own official release refuting your assertions? 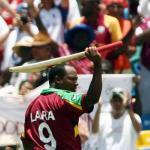 Lasana ensure that you file charges against this man. I shudder to think what would have happened if that was me because my temperament isn’t as sound as yours. File charges against this man and let the law deal with him fully. 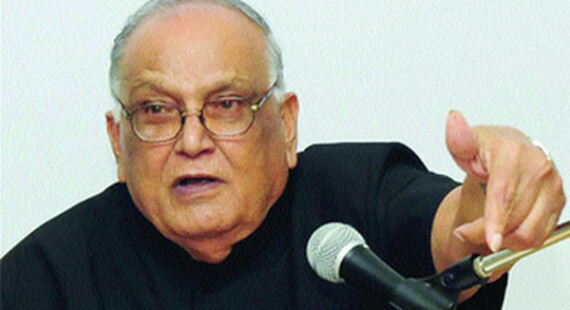 Malik charges filed. And thanks. This man cares about the law or public or mutual adults?